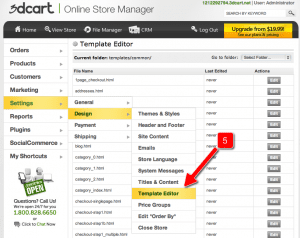 3dCart Website Builder Review – Is This the One to Go for? 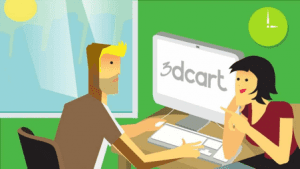 3dCart is a website builder that focuses specifically on eCommerce. Their goal is to help you build a comprehensive online store. 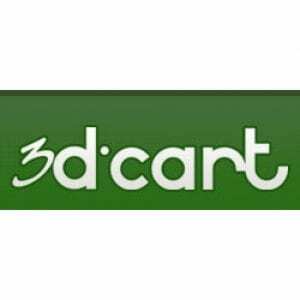 The name of the company, 3dCart, is somewhat ambiguous, because it is not clear what the “3d” represents. However, it is likely that they chose that name because they wanted to offer a shopping cart that truly includes everything anyone could possibly need for an online store. Through 3dCart, you can sell digital products and hard goods. You can either manage a single vendor or multiple ones. Essentially, it does what you need it to do whether you are a high volume sales store, or only a weekend vendor. To further demonstrate that they have something for everybody, they also offer a range of pricing tiers, making them very competitive. Furthermore, since they offer a 15 day free trial, without needing to enter your credit card number, you really have nothing to lose by giving them a try. The company was founded by Gonzalo Gil in 2001. It currently operates out of Tamarac, FL. Some 17,000 individual customers use their platform and they continue to experience significant daily growth. Through the information below, you may be able to determine whether or not the solution is right for you. It offers all the features you could possibly need to run an ecommerce site, including multiple ship to addresses, coupons, and affiliate programs. You don’t have to pay transaction fees, which is quite unique. This means that more of your profits can remain in your own pocket. It comes with a really cool PDF guide that gives you step by step instructions on how to migrate an existing store from a different platform to them, should you already have one. More than 90 different payment gateways are fully supported. They offer very user friendly and clean customer frontend and admin backend. If you use a point of sale system, 3dCart can fully integrate with it. Each plan only comes with limited bandwidth. They are suitable enough if you have around 2,000 to 50,000 visitors. Overall, you will pay $5 in bandwidth charges for every 1,000 visits. There is no opportunity to set up a recurring billing system. This means that you have to purchase a separate, third party app, and hope it is supported. Launched in 2001, the company has never stood still and has frequently released new updates and features. Often, they update their existing features so frequently that they can actually be classed as new ones. Furthermore, they offer a number of truly unique features, such as multiple ship to addresses and options for gift wrapping at checkout. These are very useful options that very few other website builders offer. As previously mentioned, these are just the highlights of the many features that 3dCart offers. The above are all included in the highest subscription levels, so you may not be able to access them all if you choose a lower priced plan. That said, 3dCart has listed the features in various categories, enabling you to easily find out what you need, and which plan you will have to sign up to in order to access it. 3dCart offers a number of different templates for you to choose from. Firstly, they have over 60 templates available completely free, which are great to get you started on the platform as a whole. Also included for free is full CSS and HTML support, so that you can fine tune the templates to your particular needs. These templates are pretty good to get started, but it is likely that you will soon start to outgrow them. That said, they don’t cost anything and they are all 100% mobile responsive, so if you are on a budget, this is the way to go. 3dCart also offers a number of premium templates. The top price per template is $199, although most cost less than that. You can, however, choose to sign up to their unlimited themes package. This costs $249 per year and means that you have full access to all templates. The paid for templates, speaking from a design perspective, aren’t really worth paying for, particularly since the free ones are fully mobile responsive. However, if you have no CSS or HTML knowledge and you want something a little bit snazzier, then the paid for templates are the ones to get. All templates can be customized as well, which is really cool. What sets 3dCart apart, in my eyes, is the fact that the editing tools are really easy to use. You can go into the CSS and edit it, without having to understand about coding. You can also use WYSIWYG editors to change the HTML, or you can simply use the drag and drop features if you have absolutely no knowledge of CSS or HTML. While called a ‘drag and drop editor’, it actually does a whole lot more than just drag and drop. You can add pages, products, blog posts, and categories, with all of these being visible directly in your store. This is really an amazing feature. Additionally, 3dCart offers a design service. It cannot be stressed enough how important it is to have a good looking store if you want to remain competitive in today’s world. Hence, do consider using this feature. They will ensure you appear truly professional, which will make a real difference to your business. That said, these services aren’t cheap, unfortunately, so you may want to consider outsourcing your customization instead. The app store includes a reasonable number of add-ons to further support your 3dCart site. These are laid out very clearly, with a range of categories to choose from, including enhanced interface controls, marketing, tax calculators, and fulfillment. Plus, there are lots of essential apps that are supported through the app store, including ShareASale for marketing, Olark Live Chat for ecommerce tools, Constant Contact for email marketing, Shipwire for fulfillment, and Quickbooks for accounting. Some apps are free, some require a one time only payment, and some request payment for a subscription, which generally includes service as well. 3dCart is made for ecommerce, and is actually one of the only website builders out there that does not have a focus on both ecommerce and on blogging. To support this fact, they have also partnered up with well over 100 different payment gateways. These include some of the world’s most trusted providers such as Dwolla, BitPay, Authorize.net, Stripe, and PayPal. In other words, you shouldn’t have any difficulty in finding the best payment processor for your particular business needs. As an added benefit, you don’t have to pay transaction fees to 3dCart for any sales you make. However, most payment gateways do have fees attached to their service as standard, so do make sure you have a merchant account that suits your requirements. Firstly, 3dCart offers you a 15 day free trial, no credit card required to sign up. Make sure you use this offer, so you can get a feel for how the system works. Once you are ready to sign up for a package, you have the option of paying monthly or yearly. If you pay yearly, you will receive a discount of 15%, something only a few shopping cart providers do. With every plan, you get domain registration, unlimited online storage, Facebook and mobile stores, 24/7 phone support, and API connectivity. If you exceed your bandwidth, you will have to pay $5 per Gb. If you are an enterprise, you can also use 3dCart, which includes unlimited bandwidth, enhanced scalability, a dedicated support team, and high quality security features that include the CloudFlare DDoS attack protection service. This package comes with a $299 set up fee and the costs $999.99 per month. Other, customizable options also exist for enterprises. These include Social Media Ultimate, SEO Enterprise, and myWebmaster. Through 3dCart, you will be able to receive round the clock support through telephone, live chat, and email, 365 days per year. This is available regardless of your subscription level. Furthermore, you have access to support tickets, a database of video tutorials, an excellent online knowledge base, and a support forum. 3dCart is also incredibly active on social media, meaning you can also contact them through Instagram, Google+, Twitter, and Facebook. That’s not all either. You can access the e-university for additional learning, and webinars are frequently hosted. According to 3dCart, you will never have to wait longer than five minutes on the phone, or 30 minutes through online contact. When you post an online request, you will also receive an automated message confirming that they have received your request. The company offers a huge number of features as standard, and prices that are affordable as well. This is why the company comes highly recommended by the many people who have used them so far. Unfortunately, there have been quite a lot of reports of people receiving very poor customer service. That said, they seem to have improved significantly on this over the past years. Similarly, people complained that their free templates did not have enough options included in them, and they have now changed that by allowing them to be customized as per customer needs. The Mini plan is likely to be more than enough for your particular needs. Although a starter level package, it has virtually everything you could possible need to set up your site. That said, if you do require some more specific and special features, you will have to sign up to something slightly more powerful and, therefore, more expensive. One of the things that stood out to me is that they have a maximum number of visitors in their pricing plan, something that I personally hadn’t seen anywhere else yet. This is actually my main complaint with 3dCart, as a visitor does not necessarily mean a paying customer. As a result, you may see a huge influx of people looking around, but until people start to pay for purchases, they will simply be a drain on your visitor quota. It also means that you have to keep your eye on the ball so that you know when you’re approaching your quota, so you don’t accidentally go over it.